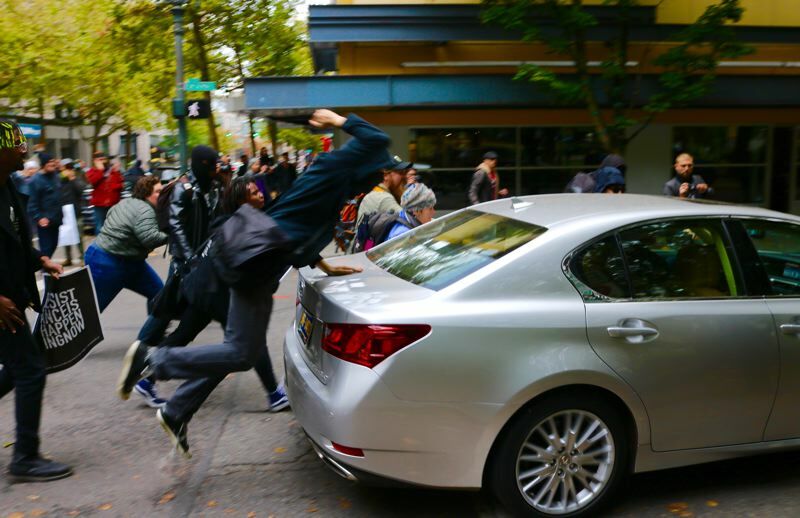 PORTLAND, Ore. (KOIN) -- Many questions remain after a driver steered his car through a crowd of protesters Saturday as they started hitting his car. The incident at SW 4th and Salmon happened during a protest for Patrick Kimmons, a man shot to death by Portland police September 30. Kimmons, 27, was shot and rushed to a nearby hospital, where he later died. "A gun was recovered near Mr. Kimmons, and multiple firearms were recovered in the area of the crime scene," officials said October 1. The demonstrators gathered in the streets to demonstrate against police using deadly force. During that demonstration, a man driving a silver Lexus drove through the crowd. He had a green light to make the turn but the walk sign was on for the crosswalk. Protesters began hitting his car and someone got in front of the Lexus. Video captured by Brandon Farley shows the driver inching forward, getting clear and driving away quickly. He stopped less than a block away, got out, looked at the damage to his car quickly, then got back in as protesters arrived and again began hitting his car. In an interview, the driver said he got out of his car earlier and asked protesters to move. But, he said, they grabbed him. He got back into the car, which is when they began beating on his car and smashed his driver's side window. The person in front of the car was trying to lift up the front end as the driver was trying to get out of the area. The driver said there is $3000 damage to his car. He called the police to file a report after he left the area, which police confirmed. No one has filed a police report against the driver, and no charges of any kind have been filed at this point. PPB Sgt. Chris Burley said officers were monitoring the protest. Asked why police didn't step in when protesters went into the streets and affected traffic, Burley said the bureau "weighs the ability for people to gather to practice their First Amendment rights to freedom of speech and assembly, as well as the impact it places on the rest of the Portland community. Throughout this event the police bureau was monitoring the crowd." Anyone with direct knowledge of this incident is asked to contact Portland police. KOIN 6 News is a media partner of the Portland Tribune.